@Waldenbuch | Get Your Grub On! It was my sister’s birthday and my mom had booked a table at ‘Restaurant Roessle’ in Waldenbuch where we met family and some of my sis’s friends. They had changed their menu slightly since I have been here the last time but all the old favorites were still there. 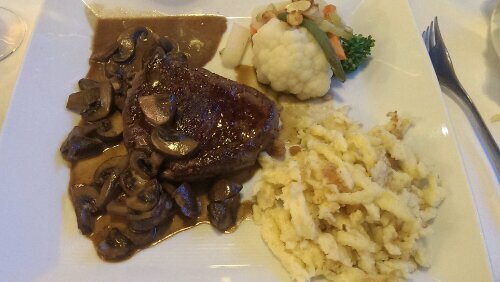 I ordered the ‘Rinderfillet Jaeger Art‘ (beef fillet with mushrooms) and remembered to order it rather rare what my recent visit at the ‘Bootshaus‘ had teached me. The first cut into the lovely charred meat proofed that this was the right decision as it was perfectly rose and juice in the center with a surprisingly strong beefy taste for a lean cut like this. The mushroom sauce was rich and creamy but tasted so delicious I completely wiped it off the plate using the tasty handmade spaetzle (local type of pasta). The spaetzle were soft, fluffy and light and were sprinkled with in butter fried breadcrumbs that coated them with more texture and flavor. Home. ‘Roessle’ had been around for some generations and offers a very nice selection of regional specialities in a more up market atmosphere which also has it’s price tag and makes it a place for rather special occasions. Also the service is more than friendly and the salad bar is awesome, just saying.